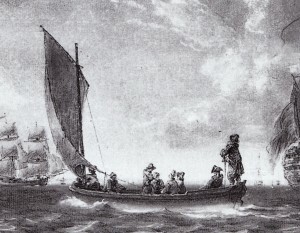 Here is another 18th century image of a boat with a lug sail. This is, I think, by the brothers Ozanne, and is of a boat in Cherbourg. I have been looking through La France Maritime au Temps de Louis XV et Louis XVI: Gravures et dessins des frères Ozanne. Peintures de Joseph Vernet by Alain Boulaire (ISBN 2-911468-75-9). I haven’t made an effort to read the French text, yet. From The Elements and Practice of Rigging and Seamanship by David Steel, London: 1794, pp. 109-110. This sail is quadrilateral, and made of canvas No. 7 or 8. The head is bent to the yard, which hangs obliquely to the mast at one-third of its length, and extends within 4 inches of the cleats. The fore-leech is as deep as the length of the head, and the after-leech is longer than the fore-leech by nearly half the depth of the fore-leech. Gores. Two or three cloths are gored on the fore-leech, and an even gore of 6 inches per cloth is made on the head. The foot is gored with a sweep; the cloth at the clue being cut with a three-inch short gore, the next cloth is square, and the cloths from thence to the tack are gored at the rate of six or eight inches per cloth. Two small holes are made in each cloth in the head. This sail has two reefs parallel with the foot; the upper one is half-way up the fore-leech, and the other is equally distant from that and the foot. Sometimes reef-bands, three or four inches broad, are put on at the reefs, but when these are not used, a small hole is made in every seam instead of them. Reef-hanks are used instead of reef points; for which see page 27. Small cringles are made on the leeches at each reef; earing-cringles are made at the nock and peek; and 10 or 12 strands in the length of the rope are seized at the tack and clue. To find the quantity of canvas, refer to Rule IX. page 37. Here is a 33 foot launch specifically designed to carry 150 gallon barrels of water. The scan is from The Boats of Men-of-War by W. E. May, p. 43. Here is a scan from The Boats of Men-of-War by W. E. May (a wonderful book). 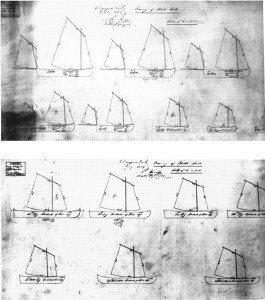 It is entitled “Official drawings of boat sails, dated Devonport Yard, 15 July 1869”. It is an interesting selection of lug sails. We’ve obtained the material to make a lug sail for one of our bateaux. The historical references to bateau sails is split between square sails and lug sails, with a few more reference to square sails. I have also found a single reference to a sprit sail. I made a square sail which we have used for years. We’d like to make a lug sail to try it out. I was looking through Ships and Seamanship: The Maritime Prints of J. J. Baugean by John Harland, Anapolis: Naval Institute Press, 2000. This is a collection of plates published in 1814 and 1819. On page 73 is a plate with a good view of some simply rigged lug sails. This is a scan from Surirey de Saint-Remy’s Memoires d’Artillerie, Troisieme Edition, Volume II, plate 98, Paris: Chez Rollin Fils, 1745. 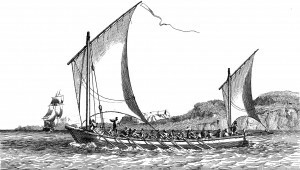 It shows a wagon intended for pontoon boats similar to bateaux. 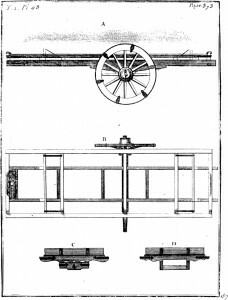 The design is intended to be used with a set of wheels and shafts for horses or oxen that would attach to the left end of the wagon. We’ve often wondered if there was a particular way that barrels were always loaded. We’ve tried loading barrels in the bateaux both with the bilge down and with the head down. We’ve also tried with the bilge of the barrel athwart the vessel and with the bilge along the axis of the vessel. 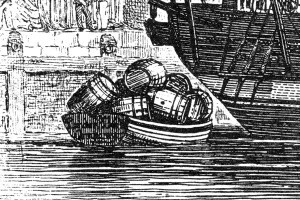 As far as convenience of loading empty barrels, having the bilge along the axis of the vessel seems easiest and gets the most barrels in the bateau, but I have no idea if this was the standard method or not. I was looking through Sailing Vessels in Authentic Early Nineteenth-Century Illustrations (“Sixty Five Plates of Shipping and Craft”) by Edward William Cooke, originally published in 1829 with reprints at various times. I have a Dover Publications book from 1989 (ISBN 0-486-26141-7). 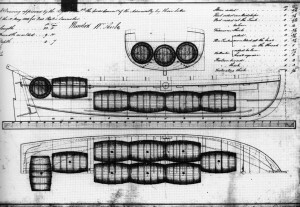 On page 16 is a plate which shows a small boat loaded with barrels (see picture). Rather than the barrels all being stacked one way or another, they are all in a jumble, stacked any which way. From this, I conclude that there is no standard method of loading them. Here are two more pictures from New York: A Pictorial History by Marshall B. Davidson, Charles Scribner’s Sons: 1977. I’ve seen these published in other spots. Both are related to the attack on Fort Washington in 1776. Note the strangely tall square sails. Here are two references to woman sailors in the British Navy. This isn’t strictly bateau or Big Row related, but interesting anyway. There is a further note of a female sailor on a Whitby collier. The HMS Hussar has a crew complement of 270, including one woman. She was killed in action Sept. 11, 1814 at the Battle of Plattsburgh Bay shortly before the HMS Hussar struck. 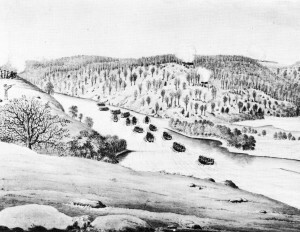 While looking through New York: A Pictorial History by Marshall B. Davidson, Charles Scribner’s Sons: 1977, I came across a drawing of the funeral of General Fraser at Saratoga. 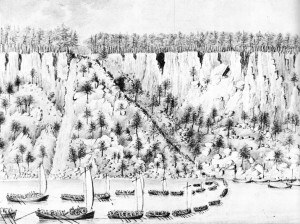 This includes the waterfront along the Hudson River showing quite a number of bateaux, plus three scows, one of which has a cannon on it. A few days later, someone posted a link to a high-resolution image hosted by Brown University. See here: http://dl.lib.brown.edu:8080/ImageServer/scrollnav.jsp?filename=1168005686203125.jp2. Here is an excerpt from the image with the bateaux.